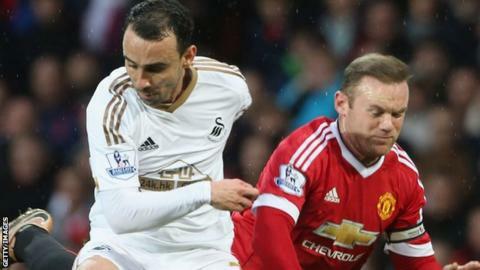 Swansea midfielder Leon Britton says Wednesday's Premier League match with Sunderland is one of the club's most important in years. A day after selling Jonjo Shelvey to Newcastle, struggling Swansea host Sam Allardyce's side, who are two places below them in 19th in the table. Britton, set to play his 500th match for the Swans, said: "These last few games are massively important. "You can feel it around the city how important it is not to lose." Britton, 33, made his Swansea debut in 2002 and played in the 4-2 win over Hull City which saved them from relegation out of the Football League in 2003. That win set the foundations for Swansea's rise to the Premier League, and Britton says the match with Sunderland has a similar atmosphere. "These games have that kind of importance," he added. The match is the first league game for interim Swansea manager Alan Curtis since his appointment until the end of the season following Garry Monk's sacking. Former Swansea and Sunderland winger Leighton James, who played alongside Curtis for Swansea and Wales, told BBC Radio Wales: "If you could call a game a 10-pointer, instead of the proverbial six-pointer, then this would be one of them. "It is the biggest game of the season without any shadow of a doubt." On Wednesday Sunderland boss Allardyce will become only the fifth manager to reach 450 Premier League games. He joins a select group containing Sir Alex Ferguson, Arsene Wenger, Harry Redknapp and David Moyes. The Black Cats have won only one of their previous 15 meetings with Swansea, who have won eight of those contests. Seven of the past 10 games between the teams have ended in a draw, with Sunderland's most recent victory at Swansea in November 1963. Sunderland lost 3-1 at Arsenal in the FA Cup third round on Saturday, while Swansea were knocked out by League Two Oxford United on Sunday. "Sunderland rested a few at the weekend - they wouldn't have expected to beat Arsenal," said James. "It's all about this game for them. "But you have got to fancy Swansea to win it. They are playing at home, against a team below them, and are all playing for Alan and the club, so I do fancy Swansea."